Traditionally styled, this sideboard will make the perfect addition to any room. 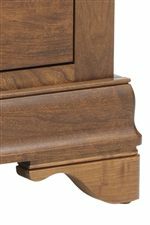 This piece is constructed from solid hardwoods for quality that will last. Beautiful molding detail and bracket feet give this sideboard an elegant touch. 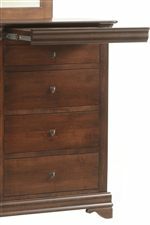 The two drawers and three doors are perfect for storing and organizing, while two hidden drawers offer a unique feature. Hardware and finish options let you create a piece that is perfect for your room and your style. The Versallies Sideboard with 4 Drawers and 3 Doors by Millcraft at Saugerties Furniture Mart in the Poughkeepsie, Kingston, and Albany, New York area. Product availability may vary. Contact us for the most current availability on this product. Finish & Paint Options Hardwood and finish options include Red Oak, Lyptus, Brown Maple, and Rustic Cherry. Handles & Hardware Hardware options allow you to create a piece that is custom to you and your home. Choose handle and pulls that are sleek and simple from the Bungalow, Hammond, or Stanford collection, or go for a decorative look and choose the Gotham collection. Case Detail Beautiful crown molding with bracket feet. 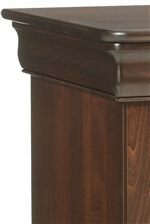 Drawer / Shelf Construction Dovetailed joints provide strength and stability in each drawer. Each drawer shelf can hold 200 pounds of live weight. The Versallies collection brings you handcrafted pieces made from solid North American hardwood. These pieces are durable and bring a simple, yet, traditional style to your home. With an array of beds, dressers, chests, and nightstands, this quality home decor collection features items no bedroom should be without. Intricate details like crown molding and classic bracket feet make this collection an elegant choice. Quality construction, durability, and comfortable beauty come together in the Versallies collection. The Versallies collection is a great option if you are looking for Traditional furniture in the Poughkeepsie, Kingston, and Albany, New York area. Browse other items in the Versallies collection from Saugerties Furniture Mart in the Poughkeepsie, Kingston, and Albany, New York area.